07/08/2004 - Hazard Communication: classification of uninterruptible power source batteries and office chemicals as consumer products. Title: 07/08/2004 - Hazard Communication: classification of uninterruptible power source batteries and office chemicals as "consumer products". Thank you for your February 3, 2004 letter to the Occupational Safety and Health Administration's (OSHA's) Directorate of Enforcement Programs (DEP). Please be aware that this response may not be applicable to any question or scenario not delineated within your original correspondence. You specifically requested a written confirmation of your interpretation of 29 CFR 1910.1200, the Hazard Communication standard's (HCS) classification of [Uninterruptible Power Supply (UPS)] batteries and its applicability to office employees. Your statements are paraphrased below, followed by our responses. 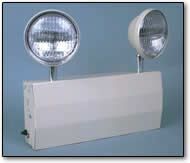 Battery-powered emergency lighting, exit signs and photoluminescent products are available at Safety Emporium. Statement: Nixon Peabody, LLP, uses sealed batteries, known as Uninterruptible Power Supply (UPS) batteries as backup emergency power for computers and telephone systems. It is our belief that these batteries, which are used solely in an office context and are handled by contractors, are either articles or consumer items, as is defined in 29 CFR 1910.1200(c) and are, therefore, exempt from the requirements of the HCS, as either articles or consumer items. Response: While your letter does not provide enough specific information about your operation and those of the clients your firm advises, we can provide you with a more general interpretation. Batteries used in small UPS units for protection of individual computers could, as you concluded, be considered consumer items. However, banks of batteries used to provide emergency power for an entire system would not. In the scenario you describe, your employees would not normally have exposure. Batteries on a whole, although sealed, have the potential to leak, spill, or break during normal conditions of use and foreseeable emergencies and expose employees to sulfuric acid and lead. Additionally, they have the potential to generate hydrogen gas. Since your office employees are not required to maintain these batteries or use them as small UPS units, they would not normally have exposure and, therefore, would not be covered by the HCS. However, the facility may have employees, such as maintenance workers, who access the area where batteries are stored. These employees, as well as the contractors who handle these batteries, are entitled to information regarding the hazards of exposure under the HCS. When this is the case, OSHA considers acid batteries to be hazardous chemicals (not articles) as they have the potential to rupture, spill, or leak. The employer, therefore, must obtain and maintain product Material Safety Data Sheets (MSDSs), ensure that the batteries are labeled, and have a written program which describes how the hazard information will be transmitted to other employers whose employees may be exposed. 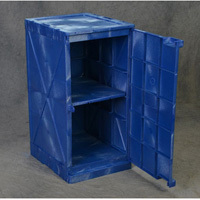 Get your corrosion-resistant polyethylene acid storage cabinets from Safety Emporium. The consumer products exemption applies when a product is defined a "consumer product" by the Consumer Safety Act (15 U.S.C. 2051 et seq. ), and "the employer can show that it is used in the workplace for the purpose intended by the chemical manufacturer or importer of the product and its use results in a duration and frequency of exposure which is not greater than the range of exposures that could reasonably be experienced by consumers when used for the purpose intended" [29 CFR 1910.1200(b)(6)(ix)]. It is not clear to us that these batteries are a "consumer product" as that term is defined by the Consumer Products' Safety Commission. The term "consumer product" means any article, or component part thereof, produced or distributed (i) for sale to a consumer for use in or around a permanent or temporary household or residence, a school, in recreation, or otherwise, or (ii) for the personal use, consumption, or enjoyment of a consumer in or around a permanent or temporary household or residence, a school, in recreation, or otherwise . . . (15 U.S.C. 2052). UPS batteries are not generally sold for use as a consumer product. Statement: A review of our firm's and clients present use and storage practices for office chemicals such as white-out, adhesive, copier chemicals, and cleaning agents, established that the offices use only small quantities of these chemicals. Response: OSHA considers office chemicals such as white out, cleaning chemicals, and copier chemicals to be exempt under the provisions of the rule, as consumer products. Consumer products, which are hazardous chemicals as defined by the HCS, fall under the provisions of the standard only when they are used with greater frequency or duration than a normal consumer, or for uses not intended by the manufacturer. For instance, OSHA has previously stated that intermittent or occasional use of a copying machine does not result in coverage under the rule. However, if an employee is hired to service the machine (such as for a copier repair position), then the HCS would be applicable. Thank you for your interest in occupational safety and health. We hope you find this information helpful. OSHA requirements are set by statute, standards, and regulations. Our interpretation letters explain these requirements and how they apply to particular circumstances, but they cannot create additional employer obligations. This letter constitutes OSHA's interpretation of the requirements discussed. Note that our enforcement guidance may be affected by changes to OSHA rules. Also, from time to time we update our guidance in response to new information. To keep apprised of such developments, you can consult OSHA's website at http://www.osha.gov. If you have any further questions, please feel free to contact the Office of Health Enforcement at (202) 693-2190. Encourage safety rules with motivational banners from Safety Emporium.